Thank you for joining us in praying to St. Philomena, the wonder worker! If you experienced any answered prayers during this novena, please share them with us below! We must praise God, and give Him all the glory, for all the good things He is doing in our lives. Thank you, St. Philomena, for complete healing and restoration of good health! Thank you for the signs along the way and for your powerful intercession on my behalf. Please intercede for L and B in their quest to become parents. Please pray to St. Philomena for me to be healed of a broken heart. I was in relationship with someone for 2 yrs. that i met on a Christian dating website who led me to believe he truly loved me and wanted a future with me and as Catholics someday marriage but i was decieved. He cared more about money than he did about me. Would you pray that God would send me a good husband..someone respectable, compatable and mostly sincere who loves God..and would also pray with me for my family and loved ones. Thankyou. Amen. powerful intercessor for the babies , please intercede for our baby son and obtain from God health for this child. Pray for this child to be born free from trisomy 18 and any other chromosomal defects , and our cvs test tomorrow come up negative with anything wrong with my son. ask God to grant peace, patience, and strength to us Amen. I am begging you to pleasw heal my son Lucero Tamayo who is currently in NICU. Please take away all his illnesses and that his brain will mature normally and take away any problem in his brain so he will live a healthy and normal life. Please grant my request St. Philomena.. Please and thank you. She is a patron Saint of youth, children, young couple’s. I prayed to Saint Philomena for a job with no high expectations and just tried to stay happy in my current job. I got a call next day and went for an interview the immediate next day got a spot offer of what I wanted and it’s more than what I wanted. St. Philomena I Know you are the wonder worker please pray for me I want work as a teacher in Us next school year 2019 please pray for me. Please intercede for my sister, Ruth, who is seriously ill with ovarian cancer. Today, she is in great pain and cannot swallow. She just started a new cancer drug yesterday. My sister and I live hundreds of miles apart. I feel helpless and I want help, but she does not want me to be with her yet. Please Saint Philomen pray for Ruth’s cancer to subside and allow her to be pain free. Allow Ruth the time to receive your healing oil that may possibly heal her. We are waiting anxiously. If it is God’s will, please pray for my sister to be healed. St. Philomena please do not abandon me, pray for me unceasingly. I am weary, but I have placed my hope in God and His promise that He will never put me to shame. Lumina, be my advocate and my vindicator in the courts of heaven for you hate divorce. Intercede for restored contact and communication between ERS and I, that the Lord will make a way where I see no way. St. Philomena you are powerful with God, pray for me. Dear UMS, am touched by your prayer and I hope and pray that through st Philomene, God answer your prayer. I want to thank Saint Philomena and the Blessed Virgin Mary for their intercessions to the Heavenly Father for answered prayers! St.Philomena, thank you for alleviating my brother’s pain and reducing his blood pressure immediately. I continue to seek your divine intercession for his complete healing, and for the restoration of my marriage. St. Philomena, you are powerful with God, pray for us who have recourse to thee. Only You are Holy Lord! Only You are Worthy! You are my life, my love and my testimony. Thank You Abba Father. Thank you St. Philomena. You walked through the storm with me from the very beginning. You stayed watched over me at night, when I anxiety gripped me with fear. You granted me my miracle and the job is mine. You also taught me that destiny is determined by faith, not by strength or might. Lumina I honour you, and I give you my word that I will deliver on my promise. I ask for wisdom to discern the Lord’s voice, and the fortitude to walk His way, as I continue to ask for your intercession for my brother and my other prayer intentions. You’ve restored such great hope for me. I am overwhelmed with tears of joy and gratitude. Thank You Lord for reigning over all my circumstances. Thank You, St. Philomena, you are Powerful with God. I pray to u with all my heart that u send me my husband soon. I’ve been praying to you for quite awhile and every man I’ve dated is worse then the last. These men have stolen from me, beatened me and have cheated on me. I don’t understand this Saint Philominia. I’m a good person with a good heart and am very kind and I keep getting hurt and burned over and over. Please Saint Philominia send me a kind, gentle and we’ll educated man with a good job. A man who wants awife. Thank you Saint Philominia for listening to my prayers. Oh! St. Philomena, powerful with God, pray for me. I am clinging onto God’s promise that He will provide my every need, according to the glorious riches of His Son, Christ, Jesus. St. Philomena by your grace obtain for me God’s unmerited favour that I may be offered the job I interviewed for. It’s been 10 days since they last contacted me, and often I get anxious and weary, but I’m on my knees. They sounded positive, but now I am not sure anymore. A week ago, I was suddenly invited for another interview, the first part of which, I completed this morning. I do not want to miss God’s best for me Lumina. I want to serve Him by being a blessing to others, but I desperately need an answer; a new beginning; a breakthrough. Now more than ever. My brother who is the sole breadwinner, was laid off this afternoon, and is devastated. He has been supporting me for the past three months, but we are now both unemployed. St. Philomena, if only I would hear a favourable response from the hiring managers. Please continue to intercede for me. 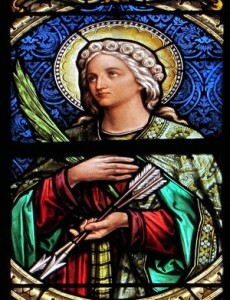 Happy Feast Day St. Philomena. Thank you for teaching me that I have nothing left to do, but everything for me to believe, because Jesus has done it all for me. Yesterday, out of the blue, I received an invitation to interview with a different agency, in a week’s time. I am grateful for the opportunity, as I wait on God’s favour for the outcome of the other job. Help me to press into the great things that the Lord has in store for me, and not to give into discouragement. I love you Lumina. My heart is full. St. Philomena, I do not know where to begin expressing myself, but I will speak from the heart. The journey has been one emotional rollercoaster, but you have been strong and steadfast. Holding my gaze and my hand throughout. Three days ago, I shared your story with my family and my eleven year old niece. Much to my surprise, she mentioned to me that her class teacher was called Philomena! It filled me with even greater hope, and I’ve continued to seek your intercession as we approach your feast day. Oh Lumina, how I wish I had known about you ages ago, I believe with all my heart that my destiny would have been different. Still, I thank God for the strong pull that has drawn me to you and kept me on my knees, meditating on God’s promises. Indeed, you are powerful with God. With love and appreciation from all of us, who seek your intercession every day. I can’t wait to share my testimony. St.Philomena, I was drawn to you several weeks ago, almost as if magnetically. I’ve been waging a storm, which seemed surmountable, and I had reached my very end. I began to seek your intercession for a job. When anxiety and emotions threatened to get over me at night, I’d wake up with tears and cry out to you over and over. Suddenly, every week I began to see miraculous shifts. My application was under review. I was then invited for a written test, and I was overwhelmed with gratitude! I did the test, and anxiety set in, as I felt I had not done my best. Yet, again you surprised me when I passed, and went to the final round in less than forty eight hours! I can’t describe in words how stunned I was at the quick turnaround. Yesterday, I had the oral interview, but I’ve been so anxious, as I feel my performance was not the best. Yet, I so desperately need this job, St. Philomena. So I continue to lay prostrate at your feet that by your grace, you will obtain for me this favor Lumina. There’s no turning back, only pushing forwards and thanking God for having introduced me into my life, for never have I felt such constant and instant peace during my darkest hours. I promise to spread devotion to you St. Philomena. My heart is full of so many emotions right now, my face laden with so many tears. Keep holding the hem of His garment, Lumina. I believe, help my unbelief. Thank God for everything. Two months ago my sister-in-law ONYEKACHUKWU OMENYE OBI called me and said that doctor said she will deliver again with C/S operation. I replied her that that is Doctors report. I send her Novena of Saint Philomena which we prayed daily for these two months till this morning of the feast of Saints Jeochin and Anna she delivers normally a baby girl who has being named Philomena as we promised God. ST PHILOMENA PRAY FOR US AND THE WHOLE WORLD. AMEN. St philomena plz help me and pray to our dear Lord Jesus Christ to heal me from the hepatitis b I was diagnosed with, am the only child of my mother ,plz heal me from this illness and the pain in my ear and the noise in my head in return I will devote myself in spreading ur devotion to the world.please help heal my mum from asthma that keeps disturbing her and the stomach ulcers that keeps hurting the both of us,grant me a good husband who us kind, loving,respectful close to God and wants to spend the rest of his life raising a family with me(white man).financial breakthrough. Thank you Holy Mother and St. Philomena for granting my prayer request for my husband. Please help my daughter. Thank you for your love everyday. Thank most Loving Mother and St Philomena. Dear St.Philomena thank you so much for healing my dad of Cancer. Thank you so much for helping my sister find a great husband.Thank you so much for all the answered prayers.You are a wonder worker.Thank you so much for my beautiful family. God will never refuse anything that St. Philomena asks for us. hello Claire,am Sharon,could plz help.me out ?am Sharon from Uganda,I was diagnosed with hepatitis b,am the only child of my mother and am so scared of leaving my mother without a linage,help me pray to st Philomena for healing, I have started praying the novena and today is my third day,I saw ur testimonies and my faith increased because I know with many voices ,I will be able to obtain healing like ur dad did,how long did u pray for ur dad?,my mum is asmathic and praying for her healing as well,could u help me out? Claire..can I ask what Prayer/s you used for St Philomena intercession? Dear.St.philomena.you never refuse to help.please help me.iam so hopeless.help my husband randy that he can have a job in abroad.help me in my financial needs i need money to pay for the tuition fee of my children.help them St.philomena that they can finish their studies.help claudette that she can pass the civil service exam.heal my anxiety and fear.heal my father also.protect me and my family wherever we go.please dear saint grant all the request i ask of you in Jesus name amen. Dear,St.philomena.please help my husband that he can have a work in abroad.and all my children can have a good and stable job in abroad.and help me also in my fiancial out break that ive facing this days.In Jesus name amen. I know you are the saint of desperate causes so I’m asking for your intercession to help me. I’m in financial debt right now. Please help me win in the 50/50 draw so I could pay off my debt and I will spend the extra money to see my mom on her 70th birthday. Also I pray for true love to find me. I’ve been hurt a few times and I want the hurting to end. Please bring the right man into my life, the one who will ask me for marriage, whom I will live happily with for the rest of my life. I need someone who will be a good financial provider for my family. Help. Im doubting catholicism. I feel like everything ive believed has been false..dark night..im praying my loved catholic boyfriend of 2 years would ask me to marry him so we can be a help to each other and live together without scandalizing anyone. We need each other financially to survive. We love each other but hes waiting for response of annulment from tribunal. It was an abusive marriage which shes living with another man with no desire to reconcile. Theyv been civilly divorced for 7 years. My boyfriend and i met in brokeness because we had both come from much darkness and abuse and rejection but want to live in the light and with God and go to Heaven. We pray for our families conversion and grace and help from Heaven. St Philomena..i know you disapprove of divorce and we do also but these circumstances are unusual and hurtful. Please remove the obstacles and allow the Church to help us. My boyfriend is afraid of being hurt again to ask for marriage but i wouldnt divorce because i believe in the sacrament and i love him. Also my debts seem insurmountable. I need a miracle St. Philomena to pay them off and that Adam would marry me. We promise to have a devotion to you in our home if were married and thankyou already for converting my father and brother and sisters and Adams brother and friends. I also pray for Adams exwife for her conversion and that as a catholic shel recognise error to not live with the man shes with unless theyre also married..especially because she has a child who is being scandalized. Thankyou St Philomena. Amen. longing for God’s touch and love. a testimonial , to relate to his word. oh st philomena my last hope. Thank you St Philomena for answering my prayer! Thank you also for encouraging my daughter to pray. Dear St Philomena, I am so grateful to you. Please pray that I receive immediate financial assistance and blessings. Also pray that I receive a good job right away. I am in desperate need. Thank you for your prayers. I am praying for you. I know you will get a miracle. I have a huge debts that i accumulated for the last 3 years and i need to pay the whole amount on january 30, 2018. I knly have one day to produce the amount or else i will be put in jail. St. Philomena, please help me. Please help me immediately. Please pray for me to our mother Mama Mary and to our Lord Jesus for my complete and total healing of my breast cancer, total thyroidectomy, gb polyp, calcium and TSH.Thank you so much for your intercession St. Philomena. Amen. Dear St.Philomena thank you so much for all the list of miracles that you have done for me and my family this year.It was a very beautiful year for us.Thank you so much for my permanent residency,thank you so much for my wonderful husband and my beautiful baby.Thank you for saving my relative who was attacked by robbers and for healing my niece.Iam spreading your devotion like I promised.love you St.Philomena. Dear St.Philomena thank you so much for the miracle of our beautiful health amazing baby girl lumina she is the joy of our family,thanks for the good pregnancy period,and all the good doctors!Thanks that she was born close to her due date and all the wonderful answers to my prayer requests!Iam here to spread your devotion and to tell people that you are truly a wonder worker.love you St.Philomena. I ask for your intercession with Mother Mary to please pray for my youngest child EK to be heal from her autism and learn to talk soon. I know this is an impossible prayer but if anyone can heal her, it is our blessed Lord. Please pray for her and I will be eternally grateful and devoted to you and beloved Mary. I may be able to give you some special help, which was born out of prayer, and from my own experiences, and I will also pray for your intentions. On my family website, I have been running for many years, a novena for the healing of autism. Twenty four novenas, are conducted each year, and are said, for people who have autism, and also for their families and supporters, by people from around the world. It is the biggest Catholic novena project, for healing of autism in the world. Many people are enrolled in this novena. (Only first names are required). This prayer campaign is supported by a priest, at the Sanctuary of Our Lady of Lourdes, in France. The people who are enrolled in the novena, are prayed for at the grotto there, and also at a private (home) sanctuary, of Our Lady of Lourdes, here in Australia. Through prayer, I found a method, to successfully teach my child, (who was born with severe autism), how to speak. My five children are now adults, My first born child, who is a girl, was seriously speech delayed. My other four children, who were also born on the autism spectrum, were not speech delayed. (One of my children, also a girl, is not on the autism spectrum). I have two girls on the autism spectrum, and two boys on the autism spectrum and one girl, who is not on the autism spectrum. Here is the method, that I developed, to teach my oldest child how to speak, (and very successfully at that). I went to all the local fetes and second hand Op Shops, and bought up colourful childrens’ books at a very low cost. Then I selected suitable pictures*, to cut out and paste into a big spiral-bound art sketchbook. One picture to each page. Under that, I wrote the story. It was devoid of the trappings of the English language. It was just a simple three or four word format to describe the picture. It went something like this: bear cooks dinner, bunny rabbit mows lawn, etc. Basically as you can see, the format of the little story is: noun verb noun. I went through this on a regular basis with my daughter. She really enjoyed the lesson. she was over three years old at the time. I put great emphasis on saying the words. I made them very clear, very distinctive and very slow, and also louder than normal speech. After several months, she started talking in something that sounded like Chinese and then later on, there was a breakthrough. One day she picked up the book, and had a look at the picture on the page, and pronounced the words: bundy rat. This was her first attempt to pronounce the words: bunny rabbit. In due course, she learnt to speak very well. Today she’s got a fair amount of independence and drives a car, reads, writes, uses computers, cooks, travels, and has a job and much more. As well as the speech method that I developed for her, which I freely share with others, via my family’s website, she had some physiotherapy at the local hospital, in the form of games, and also similar activities in the home, from the Autism Association of New South Wales, (Australia), and some pre-schooling with a carer in attendance, because she always became very afraid, and became ill, when she was at preschool without a helper. I know that now, because she has since told me. There is something else, that I would like to mention to you. It is a bit of a side issue. When I made up the speech books for my oldest child, I put the little sentences in big, bold letters, using coloured texta pens, onto the page. Basically this was pretty strange, because the only person who had to read these words was myself! I probably did this illogical thing, because of the stress that I was under, but it may have had an interesting side effect. I think that my daughter noticed the words, because they were so big and bold, and colourful, and this may have set down a good foundation for my daughter to learn how to read, later on! In fact, I now know, that this one of the methods, that are used, to help the brain development of children, who are brain damaged, and it also good, for the learning process, for children, with normal development as well. In our household, we had my mother-in-law, who could not speak very good English, and yet this did not affect any of my children in their efforts to learn to speak the English language, even though 4 of our 5 children, were affected with autism, ranging from severe to moderate. They picked up English pretty well from my husband and myself, from other people, and from the TV and radio, etc. The abbreviated sentences in the speech books that I made up, were definitely not the normal way that people speak English, but the idea was just to get my daughter to start talking. More elaborate speech could come later, and it did. If I tried to incorporate more elaborate speech, she wouldn’t have learnt anything, because autism can make it hard to cope with excessive detail, when learning. I am not bi-lingual, but I think that this method, would be suitable for teaching non-verbal autistic children in other languages also. It is best to teach in the main language of the country, that you live in, for the greatest success in this matter. I personally found that my method did not take up a lot of time, and that it worked well for me. My connections, with autism, go back much further than my own children. My youngest sibling who died in 1989, was severely autistic and he only ever spoke two words in his whole 24 years on this earth, and that was not very often either. These two words were: mum, and John, which is the name of his brother. Basically my only qualifications for teaching my autistic daughter how to speak, was a strong determination, to find a way to do so, which was driven by the terrible possibility, of seeing my daughter never speak, just as my youngest sibling (a boy), never spoke, except two words, which were spoken on very rare occasions. In other words, my method, came out of the desperation, both of a very distressed older sister, and of a very distressed mother. Both of these being myself of course. Prayer is the key, that opens the doors, in all of these matters. *Pick colourful pictures, that a young child, would enjoy. Only put in that part of the picture, that focuses on the thing, that you are going to try and teach the child to say. Don’t include any unnecessary details, in the picture, just use what is needed. Make things as simple as possible for the child, e.g. just cut out the part of the picture, that shows the rabbit moving the lawn, and leave out the child on the swing, and mum waving out the window, and so on. These other parts of the picture on the book page, can be isolated, and pasted onto another page of the art book, to have other little stories for the child, to learn to say. I am here asking for prayers and guidance from you. I have heard about your miracles and am taking a chance. I am knocking into your heart because I am so hopeless about the upcoming exam that I am going to take. For so many years I have been questioning why I took this path and is it going to be worth it? My college years were not as ideal as I expected it to be. I have been forcing myself into thinking that I have made the best decision in my life. But of course I feel like it was the right decision. I did it for my love ones, I sacrificed for them and It was worth it. I love them too much so I don’t wanna hurt them. I let my dreams go and let God do his way. But still, I can’t fill the emptiness within my heart. I feel so unsure about my future and am douting myself, my capabilities. Please hear my prayers. I wanted to pass this upcoming challenge. Hear me out, guide my soul. After this obstacle please clear my way, help me find my path. I wanted to make my parents proud, proud of themselves to have raised me right and will return all the favors they sacrificed for me. I will continue to praise God’s glory and will praise the saints in heaven above. Help me in building my confidence to fight this journey with all might and with the strengths from the Glory of God Almighty. This is all for you. Continue Gracing the world with blessings! I have the same prayer. I will pray for you too. Thank you for answering our prayers all these while. I declare you as the patron saint to my family. Now I beg you to help me to get a new job as a corporate trainer so that I can pay all debts and support my family financially and attend Mass on Sunday. I will do my very best to spread devotion to you and build a mini shrine in my house for your honor. Thank you my dearest St Philomena. I want to praise and thanks saint Philomena for answering my prayers for these sets of twins for Avery and Sadie preemies they couldn’t breathe or be fed on their own but with the prayers from yesterday they will be going home next week because they are breathing and feeding themselves on their own thank you my Auggie his heart surgery it was successful and he at home doing well now we pray for the other set of twin that Brielle six months shape her skull the way the Lord intended for her there’s no tumor to probably wear a helmet shape her little head St Philomena and I also prayed to my blessed mother and my Lord Jesus Christ for Brielle healing Amen???? Please heal my joints, especially my wrists and knee. Thank you for this miracle and I will spread devotion to you. Was so nervous because of the biopsy result, sleepless nights because im so worried about the result since i have a 15mo old baby. The doctor said the nodule got bigger hence higher chances of it being malignant. I googled the bio of the saint and novena prayer to St. Philomena. I prayed it every night and somehow I got confident, I worried less and less until I worry no more. The prayers and novena to her, with God ultimately, helped me. I just got tge resulta now and yes, it was benign! Thank you God, Mary and St. Philomena. Praying for calm for my teenage daughter as she tries out for a team. She’s worked hard, but nothing in life is a guarantee. I’d love for her to make the team, but I’m praying she does her best. Saint Philomena, truly a wonder worker of miracles! A huge debt paid in full .. miraculous and indescribable. She is truly a wonderful saint whom God has blessed greatly and given unbelievable graces to. I will always be thankful. St. PHILOMENA, So wonderful. I received all that I asked for while sending my son back to school. I was in a total fix, not enough school fees, school requirements,etc but she did it all. Received money from different sources for him. All was covered. THANK YOU. She is so great. Powerful with God. Our mother continue praying for us as we put our trust in you. Humbly that you grant my wish to transfer to another company. I wish that my prospect company through the help of former colleague contact me and approve my transfer before my leave finishes. Please, help me… Thank you in advance…. St. Philomena heal my father from his chest pain! Pray hard for a full recovery. He needs your help now!!! St Philomena is my sweetest friend, today iam here again to say thank you so much dear St. Philomena for 2 great miracles that you gave me this week, you are a wonderful saint and I promised that I will spread your devotion in my country and build a statue of you for my local community church. I want to encourage all those praying to her keep praying,she is a miracle worker.Love you ST.Philomena. Thank youSt. Philomena for helping me pas my exams! St Philomena though I have given hope. Please bring justice into my life. May I and A be together and all the difficulties from our way may get away. Thank you St. Philomena for interceding on my behalf. My prayer was answered. I am so grateful for you praying for me. With your most powerful intercession,please intercede for me to the Heavenly Father that if it be His will ..my daughter and EK will establish a boyfriend/girlfriend relationship and have a lifelong romantic future together. In Jesus name..please let this prayer be answered. Thank you St. Philomena. Holy St Philomena, handmaid of our Lord Jesus, I want to thank you for all the assistance you gave me yesterday. I needed so much help and your hand interceded at a time when I was lost. With your help I was able to retain an attorney and find hope for my just cause after so many had turned me away. Please accept my prayer. I pray to ease the suffering of my father who is disabled from a stroke and for the well being of my children and family. My prayers were answered. My Grand daughter was saved from evil influences and through the grace of God is now in a private Catholic school. She is no longer depressed but is doing wonderful and I pray again that God will continue to bless us with the financial ability to continue to pay the tuition. It a an incredible sacrifice as her father has recently been laid off from his job but as her grandparents we have agreed to help. Please again I pray he can regain employment and I pray we can continue to help. My brother was diagnosed with cancer which had spread to his bladder and kidneys, and was wearing a catheter. He had surgery scheduled within two weeks. I prayed to St. Philomena to cure him, and offered her something extra in return to make her better known. When the time came for my brother to have his last physical check up before the surgery, lo and behold. The doctors did not find any cancer in him at all. 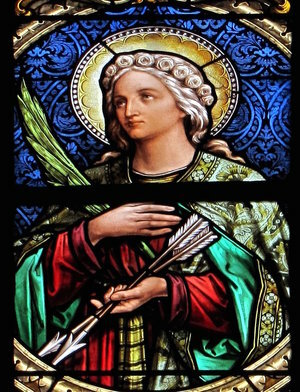 St. Philomena cured him 100%. His cancer is completely gone, not in remission but as if he has never ever had it. I will forever be in debt to St. Philomena. As the Blessed Virgin Mary revealed to Sister Mary Louisa of Jesus, “To Philomena nothing is refused”. I pray that many students will be registered for my classes so I will have jobs. Thank you.